Nikolay works as a computer scientist and researcher in the department of Networked Systems and Services in SINTEF, Oslo. He is originally from Dobrich, Bulgaria. He received a dual Bachelor's degree from the Technical University in Varna, Bulgaria and Coventry University, United Kingdom. Nikolay also holds a triple International Master's degree in Service Engineering (IMSE), awarded by the Stuttgart University, Germany, University of Crete, Greece and Tilburg University, the Netherlands. His thesis focuses on the problems of integration and co-evolution of domain-specific languages. 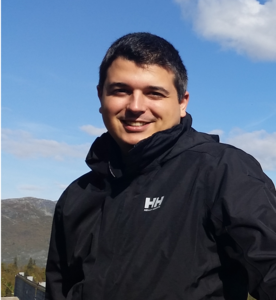 He joined SINTEF ICT in February 2014 and is currently working in the topics of cloud computing, linked data and model-driven engineering.